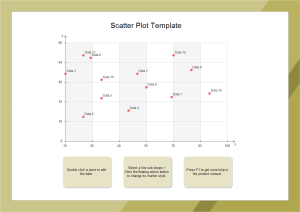 Creating scatter plot with free templates and examples. Scatter plot has never been easier. A scatter plot is very useful when we wish to see how two comparable data sets agree with each other. One of the most powerful aspects of a scatter plot, however, is its ability to show nonlinear relationships between variables. Moreover, Scatter charts can be displayed with or without lines to connect the data points, and connecting lines can be displayed with or without data markers. The scatter diagram is one of the seven basic tools of quality control. With scatter chart software, users can instantly create scatter plots for revealing relationships or associations between two variables. The built-in template can import data into the chart. A mark, usually a dot or small circle, represents a single data point. Each dot on the scatter plot represents one observation. There are some nice looking predefined styles available to set with one click theme. Edraw software offers you plenty of special scatter and bubble shapes including scatter plot, bubble. With the special scatter and bubble shapes, your diagram will look more professional. 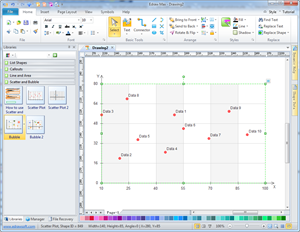 Get started quickly from a scatter plot template which is easy to edit and ready to use.